Jharkhand High Court Recruitment 2016 – 308 Assistant & Assistant/ Clerk Posts:- High Court of Jharkhand has published latest notification for filling up 308 posts of Assistant, Assistant/ Clerk. Desirous & eligible candidates can apply in prescribed application format on or before 31/03/2016. Educational Qualification: Graduation from a recognized University. Knowledge of working on computers & typing in computer. Application Procedure : Eligible candidates can send their application in the prescribed format along with all essential documents to the Registrar General, High Court of Jharkhand, Ranchi on or before 31/03/2016. High Court of Jharkhand has published latest notification for filling up 173 posts of Personal Assistant, English Stenographer, Hindi Stenographer. Desirous & eligible candidates can apply in prescribed application format on or before 31/03/2016. 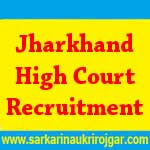 Subscribe our free job alert mail for Jharkhand High Court Recruitment 2016.